This book is designed to help prepare students for a successful career in the Australian fitness industry. 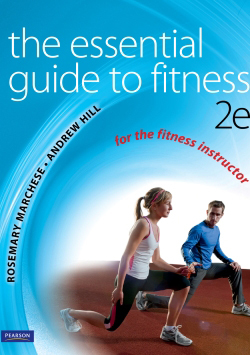 Written to align with competencies from the new SIS10 Training Package, the text introduces the essential skills and knowledge for a career as a fitness instructor. Working in a sport and recreation environment. Objectives outline the key topics to be covered in each chapter. Workout exercises consolidate the learning in each chapter. Case studies provide practical application of theory. Break-out boxes throughout the text aid students’ comprehension. Rosemary Marchese is a physiotherapist with extensive experience working and teaching for the fitness industry. She has taught and developed curriculum in certificate and diploma courses for TAFE and private institutions, and developed continuing education courses approved by Fitness Australia for trainers in the area of pregnancy and exercise. Until recently Rosemary edited a fitness magazine and she continues to write and edit in the areas of health and fitness, for both Australian and overseas publications, with a particular interest in pregnancy and exercise. Andrew Hill has taught at both university and TAFE and is Head Teacher of Sport, Fitness and Recreation at the Northern Sydney Institute of TAFE, delivering certificate and diploma courses in Sport, Fitness and Recreation. Andrew has a Masters in Health Science and is an accredited exercise physiologist and accredited strength and conditioning coach who has many years of practical experience in coaching and sports science consultancy.